Begin by grabbing one end of the memory wire in your round nose pliers. Turn the pliers to make a loop, making sure the end of the wire is turned in. This will ensure, thewire isn't scratching the wearer. Give your seed beads a good stir and then string ten of the beads onto the wire. After the ten beads, add a Czech bead. 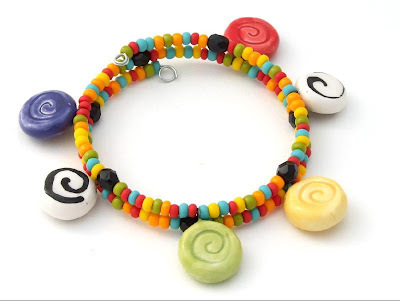 From now on string ten seed beads and then alternate between adding a ceramic charm or a czech bead. Do this until you have used all of your beads. Trim the excess memory wire, leaving an inch to make a loop. Repeat step one to make the loop. Make sure to roll he wire around until it is snug against the seed beads. Enjoy your project! This was last years Holiday Project number one. We had a new project this Wednesday that was sent out in the e-mail newsletter. If you didn't get it in your inbox that's means you're not signed up. Go to the Jangles Website to sign up so you don't miss another.